Yes! Yes, it is time for another Nightstand post. Your eyes do not deceive you and, unfortunately, neither does the calendar. I had to confess upfront that I almost opted not to do a Nightstand post for the simple reason that I didn't feel like I accomplished many of my goals from last month. I had failed. And why point this out!? But then I reminded myself that Nightstand posts help keep me focused on reading goals. So here we are. The Shape of the Eyes (linked to review) - Reviewed over at 5 Minutes for Books. I liked it, wasn't wow-ed by it, but I think it's a useful book all the same. The Keeper of Secrets (linked to thoughts) - A most disappointing read that I got halfway through before calling it quits. Write This Book (linked to thoughts) - Not my type. Not completely horrible. Just not my type. Paper: An Elegy - Didn't happen. Maybe this next month? Through Gates of Splendor - Currently in progress. Now to take a look at July. We have a family wedding in July (Jonathan's sister is getting married) and life is generally crazy with the normal every day so I won't be trying to read a whole bunch but will be grateful for whatever time I manage to squeeze in. 1. Something from Narnia!!!! Why!? Because with the month of July comes the Chronicles of Narnia Reading Challenge hosted right here at Reading to Know. Here is a previous year's introductory post if you'd care to learn more about it. I haven't decided which Narnia books I want to dive into. Jonathan bought me a copy of Planet Narnia: The Seven Heavens in the Imagination of C. S. Lewis . I've been saving it to read in July. So I suppose I'd best do that! It's been a couple of years since I read The Lion, The Witch and the Wardrobe aloud to Bookworm1 (2011) and I was thinking it could be fun to read the book and then have a little movie date with him as well. Pondering that. 2. The Wind in the Willows ! This is July's book club selection and I'll be reading aloud to the bookworms this coming month. In fact, I should get that going. We've got a lot to read aloud in July! Stephanie from Simple Things will be hosting this month's book club so be looking for some posts from her in the very near future. 3. I'm also halfway through the book War of Words : Getting to the Heart of Your Communication Struggles and would like to finish that up. Beyond those three books, I'll keep focusing on review copies. The stack has actually begun to shrink a little bit, which I find nothing short of miraculous. Wish me luck?! We'll just have to see how things go around here. Posting 3 times a week instead of my normal 5 is definitely helping me stay more on top of things (like cleaning house, cooking, home schooling, etc.) but I do have to say that I miss the blogging. It's still my ultimate goal to bump back up to five but I know if I tried to do that any time soon it would be disastrous for my family! We do what we can, right!? 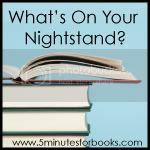 Now, off to see what's on your nightstands! Oh, I forget about Narnia, too - not totally, just in relation to the Nightstand post. Will remedy that! I might try to read Wind in the Willows, too. I saw a video of it once that was unimpressive enough that I didn't stay around to finish it, but then books are usually much richer than films. I came *this close* to not posting an update this month too, since I had so little to report! I'm really hoping to fit the Narnia challenge in, although July is super busy for us too (several birthdays and my anniversary, among other things). I'm curious to hear your thoughts on Planet Narnia. 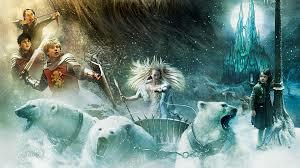 I read and reviewed The Narnia Code, which is an adaptation of Planet Narnia. I thought it was fascinating! You amaze me with all that you get done having little ones too! I have a stack of books I would like to finish before the end of the year (listed in my post) and that is what I am going to focus on I guess. I miss those days of read alouds with my kiddos. Happy reading! I've been trying to figure out my summer reading. Might just have to add in a Narnia! Agreed on Keeper of Secrets--just gave it up. Agreed on so will likely agree on the Art Forger and may just pass on it. The North Korea book in your to review pile DOES sound interesting. 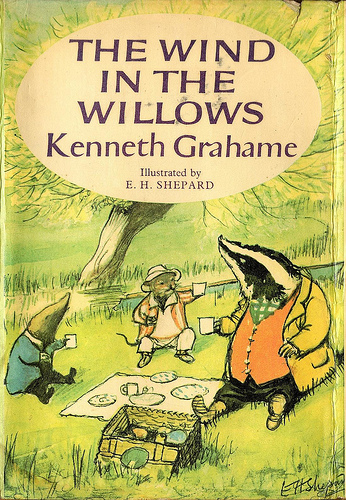 Seeing the cover of The Wind in the Willows made me smile and get all nostalgic. I remember reading that one summer when I was a kid. Maybe this summer is a great time for me to revisit it. Good luck with your goals this month! It can be frustrating to find yourself not enjoying or not getting to books you'd been looking forward to. Luckily, there are ALWAYS more books! Hope you find time to read in your busy upcoming month! I'm interested to hear about the communication book. I have recently realized how horrible I am at finishing a thought...even when a child does NOT interrupt me! Yay for Narnia! I've been itching to watch the movie so maybe I'll read the first book and watch the movie in July. Yup, sounds like a plan. Good luck with balancing blogging and the rest of life! I can't imagine trying to do 3 days a week, let alone 5. Since I have Narnia books on my Classic Club list I should read one. I have given up on reading aloud The Wind in the Willows to my kids and the last two get to listen to it on audio, since I can't find the charm in it.